After rescuing 32 beagle dogs from the experiments at the Facutly of Veterinary Medicine in Zagreb on July 21, 2005, Animal Friends last year began to mark the Day of Fighting Animal Experiments. This year the Day of Fighting Animal Experiments is dedicated to primates and huge efforts all around the European Union, which endeavors to urgently outlaw experiments on all non-human primates! 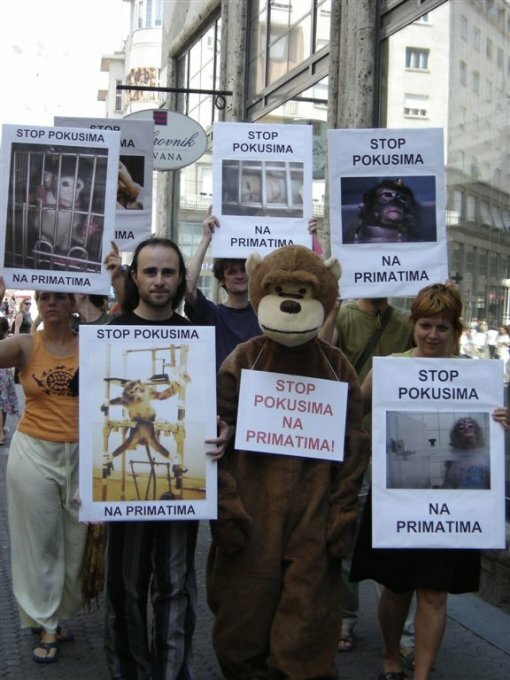 With an action "Stop Experiments on Primates," which will take place on Saturday July 21 at 11 A.M. on Ban Jelacic Square (near Dubrovnik tavern), Animal Friends will mark this year's Day of Fighting Animal Experiments. With this action, during which on the main Zagreb square a "primate" will be "crucified" in an "experiment," Animal Friends will bring into spotlight the suffering of primates in morally indefensible and scientifically questionable practice of subjecting primates to painful and invasive experiments. Also, Animal Friends will call upon Croatian public, politicians and relevant authorities to legally ban all experiments on primates in line with the efforts within the European Union. After all Scottish MEPs supported the initiative to end experiments on primates, Labour MEP Robert Evans decidedly said: "I am convinced the time has now come for politicians to take an uncompromised stand to achieve a ban on all non-human primate testing." His aim, together with 179 Euro MPs from each European country who have signed the Written Declaration, is to call for urgent action to end experiments on apes and wild monkeys all over Europe. "In the spirit of political and ethical changes within the European Union, Animal Friends will send a request to the Ministry of Agriculture, Forestry and Water Management and the Agriculture and Forestry Committee to support these efforts and ban experiments on all primates in the Republic of Croatia. We believe that Croatia will recognize the importance of such a decision and, maybe even sooner than the European Union, without hesitation say stop to outdated and unjustifiable practice of experiments on primates," said Luka Oman, Animal Friends president. More than 10,000 monkeys are used in European laboratories every year and about 1,000 of them are snatched terrified from the wild. Some of the rescued beagles from the Faculty of Veterinary Medicine in Zagreb, who will come with their guardians on Saturday on Ban Jelacic Square, will also give support to this action, whilst the public can sign the petition to end experiments on primates either on the Animal Friends web site or at one of the Saturday's info stalls. Day of Fighting Animal Experiments was also marked in Rijeka and Split.